As American Thanksgiving approaches and we take stock of all that we’re grateful for – are your donors and supporters at the top of your list? Of course non-profits and charities don’t need a special day to acknowledge the essential role your donors and supporters play in helping you meet your mission – right? After all, your donors receive confirmation emails and thank-you letters when they make a contribution – don’t they? Well according to the many blog posts and articles I’ve read, many organizations aren’t sending thank-you letters to all donors. I’ve seen stats that suggest only 1 in 4 donors report receiving a thank you letter after their donation. And many who do are sending out un-personalized form letters. But how can small resource-strapped organizations manage this? 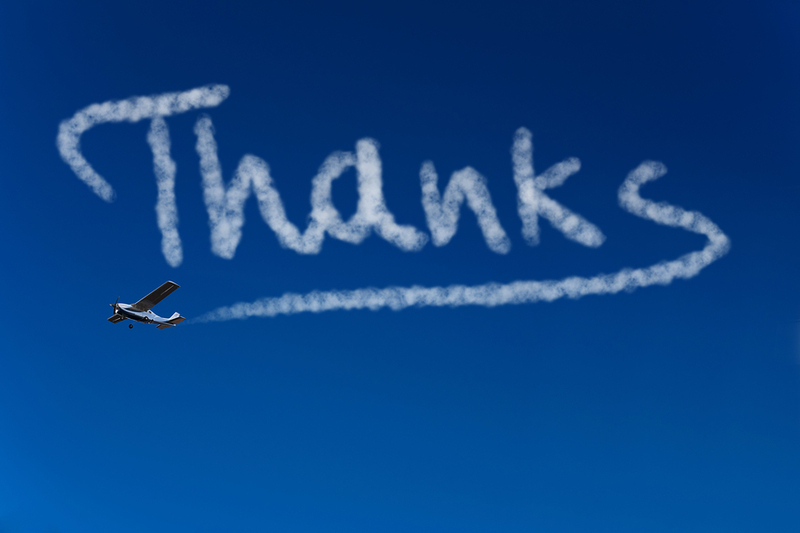 So donors are saying they’re not expecting any fancy sky-writing or video thank-you’s – just a warm, personalized letter or card. But sending out automated email confirmations and personalized thank you letters may sound simple enough for large non-profits or charities with ample staff. But this can prove challenging for small organizations are often resource-strapped, managing with a small group of dedicated volunteers or a skeleton staff. Yet while small groups may struggle to simply manage their good works, it’s clear that for those who rely on donations to fund their efforts, saying thank you to donors also needs to be a priority. If your organization is struggling with manual systems, technology can offer some support. You can consider using fundraising management software that generates automatic email confirmations and enables you to create personalized thank you emails. In addition, your member or donor database can be used to track information that will help you personalize your communications with donors. To ensure you personalize thank-you’s for maximum impact, consider gathering a team of volunteers (Board members, communications committee members, etc.) to help. You can segment your list to spread the workload around and these volunteers can also sign the letters and even add a customized note to each donor. Having letters personally signed is high on the wish list based on donor research as well as fundraising experts. As the survey stats suggest above, having the thank you letter sent by a “prominent figure” in your organization is key. Perhaps you can arrange time at each monthly board meeting to have the Chair or President sign all of the thank-you’s. Also get the Ms., Mr., or Mrs. right – since getting the supporter’s gender sure signals you don’t know this donor! Be sure all letters are proofed to ensure information is correct (e.g., their donation, gift etc.) and there are no spelling mistakes. So this Thanksgiving – say thank you for your donors and supporters. And in your year-end campaign and your planning for 2014, make it a priority to give your donors what they want – personal, prompt thank-you’s. Say thank you like you really mean it and the research suggests you’ll be well rewarded for your efforts.